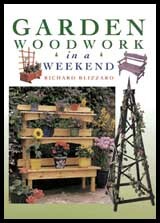 Garden Woodwork in a Weekend is a well-written book which may interest you if you have modest woodworking skills and a passion for gardening. The book is divided into two distinct sections. The first section is an introduction to tools, materials and techniques. The second section is the largest section and it details the various projects that can be built. All of the projects can be built in a weekend using mostly hand tools. Some projects will require more of a time commitment than others. The first section provides a fairly simple introduction to tools, materials and techniques. I would suggest this section for the complete novice who hasn't started purchasing any tools. I think a majority of the readers of this review would not have to read this section because you would have a good understanding of the points demonstrated. This section of the book is definitely sponsored by Stanley and Bosch. Each project is easy to understand when broken down in this fashion. There is also a large colour photo of each project. There are a number of criticisms of this book. First is the cost. It is listed at $27.95 (CAN $41.95). If it had more of the colourful photos, it might be worth it as a coffee table book. Another critique is the fact there are variations of the same project. An example would be that there are three obelisk projects and three trellis projects. These two projects account for 33% of the book and the variations aren't extreme. I did build a planter project and I found the difficulty rating and ability to complete it over the course of a weekend was fairly accurate. If one was passionate about gardening and also a novice or aspiring woodworker, you may find this book useful. If you don't fit this profile, I think you will be disappointed in this book.